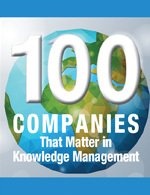 Sunnyvale, CA (February 29, 2016): eGain (NASDAQ: EGAN), the leading provider of cloud-based customer engagement solutions, today announced that it has been named to the 2016 KMWorld list of “100 Companies That Matter in Knowledge Management.” For the past 17 years, knowledge management practitioners, theorists, analysts, vendors, and their customers and colleagues have come together to select the top 100 providers defining and exemplifying best practices in knowledge management. This is eGain’s tenth year in the prestigious list. According to Sandra Haimila, Editor, KMWorld, each of those listed “represent the best in innovation, creativity and functionality… [The companies] offer solutions designed to help users and customers find what they need whenever and wherever they need it.” The 2016 list will be published in the March issue of KMWorld magazine. “Improved delivery of contextual knowledge to an employee or customer reduces a provider’s time to answer by 20% to 80%, raising competency and satisfaction. CIOs can reduce customer support costs by 25% or more when a proper knowledge management (KM) discipline is in place,” wrote Michael Maoz, Vice President and Distinguished Analyst at Gartner, in his research note “Knowledge Management will Transform CRM Customer Service,” dated March 6, 2014, Gartner Foundational July 2015. KMWorld (www.kmworld.com) is the leading information provider serving the Knowledge Management systems market and covers the latest in Content, Document and Knowledge Management, informing more than 30,000 subscribers about the components and processes—and subsequent success stories— that together offer solutions for improving business performance.